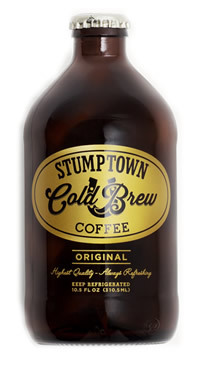 Stumptown Cold Brew Coffee is a popular coffee beverage served in Stumptown shops as well as in bottles. Listed above is what a 10.5 floz Cold Brew Stubbie contains. Stumptown Cold Brew can be consumed cold or hot as well as with your favorite whitener. We recently bought a bottle of Stumptown Cold Brew to try for ourselves. It tastes much like other cold brews which is smooth and easy to drink. I added a little cashew milk and ice to mine for a perfect iced coffee. It offers some nice flavor notes that aren't typically found in hot brewed coffee. Stumptown Cold Brew definitely packs a punch caffeine-wise and less was needed to arrive at my usual daily dose. Because of the high caffeine content of this cold brew coffee, consumers should consider their total caffeine consumption from all sources and drink this product responsibly as to not exceed the daily recommended safe dose of caffeine. Cold Brew Coffee and Water. How Does Stumptown Cold Brew Coffee Compare? Stumptown Cold Brew Coffee contains 26.57 mgs of caffeine per fluid ounce (89.85mg/100 ml). http://www.coldbrew.com/ and customer service email.